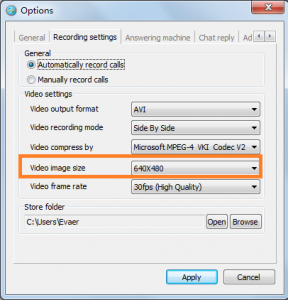 How to custom the recording Skype video resolution? Evaer video recorder default recording Skype video calls at 640X480 pixels mode. You can adjust the recording video resolution in “Recording settings“, It currently supports 320 x 240, 480 x 360, 640 x 480, 960 x 720, 1280 x 720 pixels mode. If you have HD webcam and much faster processor, we recommend you recording your Skype video calls at 960 x 720 or 1280 x 720 mode. This entry was posted in Skype Video Recorder and tagged recording Skype video resolution, recording video resolution on May 29, 2011 by admin.